The Nike Air Versitile II looks phenomenal according to a significant number of reviewers. They just love its sharp look and awesome design. Like the Hyperdunk X, most wearers are delighted that these Nike basketball shoes fit them perfectly. They are claiming that it fits like a glove. Some buyers are very satisfied with the shoe’s on-court performance. “This is one of the best pairs of basketball shoes I’ve ever owned,” one user comments. Several players are reporting that the Nike Air Versitile II is durable. These Nike basketball shoes are very comfortable, many wearers note. Users have the same praise for the 33rd Air Jordan. One buyer is forced to return his Nike Air Versitile II because the Air unit popped. These basketball shoes wear out quickly, a few users are reporting. A handful of purchasers are claiming that these Nike basketball shoes feel cheap and uncomfortable. The Nike Air Versitile II is really not a bad deal for its retail price of $75. It is a stylish, comfortable, and well-fitting basketball shoe that leaves most buyers satisfied with their purchase. However, its cheap-feeling materials may seem a bit uncomfortable and may also wear out quickly. All in all, there is very little to complain about its performance on the basketball court. However, don’t expect too much from these budget Nike basketball shoes. You’ll get precisely what 75 bucks has to offer. Made for the game’s most versatile players, these Nike basketball shoes has all your on-court moves covered. The Nike Air Versitile II provides comfort, cushioning, and a locked-in feel with its premium textile upper, visible Air-sole unit, and Nike Flywire cables. Whether you are playing pick-up ball or part of a competitive rec league, there is no better way to complement your all-around playing style than lacing up the Nike Air Versitile 2. Cushion. Delivering lightweight impact cushioning is an encapsulated Air-sole pocket located at the heel. This visible Air-sole unit offers unparalleled cushioning and impact protection, keeping your every step comfortable. These Nike basketball shoes also utilize a Phylon midsole to help protect against shock. The Air Versitile 2 also has a lightly cushioned footbed for additional support. Traction. The Nike Air Versitile II features a modified herringbone traction pattern on its rubber outsole. The durable yet flexible rubber traction enhances on-court grip to prevent sliding. Length and Width. Nike is known for producing shoes that fit true to size, and the Nike Air Versitile II is no exception. Reviewers are happily reporting that these basketball shoes fit like a glove. When ordering, they suggest getting your actual size. Lockdown. The Nike Air Versitile II features an adjustable lace-up closure for a customizable and locked-in fit. Flywire technology is integrated with the Dynamic Fit System to provide midfoot stability and a secure fit. These basketball shoes also have a luxe heel package that helps contain the foot. The Nike Air Versitile II is constructed with a premium mesh and woven fabric upper with synthetic overlays. It also features a cushioned collar and tongue and a luxe heel package that is made from ultrasoft foam-backed textile. This lightweight and breathable upper construction offer incredible all-game comfort. With a sporty mid-top silhouette, the Nike Air Versitile II keeps you court and street ready. 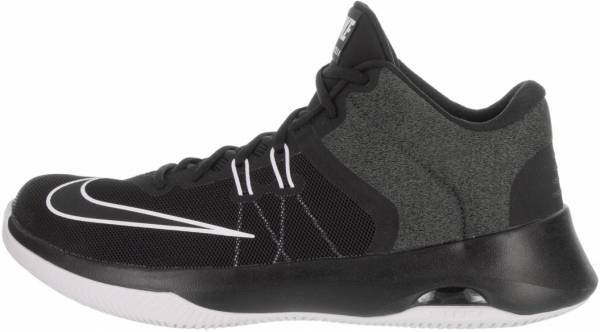 These basketball shoes keep you cushioned, contained, and supported so that you can always stay at the top of your game. Displayed on the rounded toe box is a large signature Swoosh logo that extends to the lateral side of the shoe. The “NIKE” callout is seen on the tongue tab while a smaller Swoosh logo can be found on the medial side of the luxe heel panel.